Will 2018 Really Be a Breakthrough Year in Japan-Russia ties? Despite Shinzo Abe’s optimism, analysts predict more of the same in Japan-Russia relations this year. Japanese and Russian officials met in Tokyo last week to try to make progress toward resolving the long-standing territorial dispute between the two countries. There was, from Japan’s perspective, one major problem: the same day as the talks, Russia began a military exercise on the disputed islands, known as the Southern Kurils in Russia and the Northern Territories in Japan. About 2,000 Russian troops were reported to be involved in the drills. Despite the complaints, the military exercise reinforces an overarching dynamic in the dispute: Russia controls the islands and the status quo clearly favors Moscow. Some close watchers of the Russia-Japan relationship believe 2018 is unlikely to be marked by any major breakthroughs, contrary to Japanese Prime Minister Shinzo Abe’s optimistic outlook. 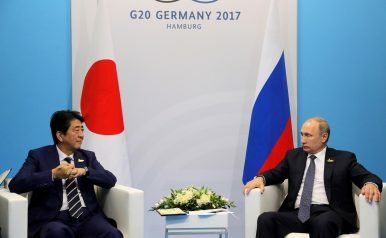 In his first major policy speech of the year, Abe argued that Japan-Russia ties had “the most potential of any bilateral relationship.” The prime minister – who is expected to travel to Russia to meet with President Vladimir Putin in May – suggested they would make further progress toward joint economic projects on the disputed islands. “Furthermore, we will steadily carry through with the items agreed upon in Nagato one by one to resolve the territorial issue and conclude a Japan-Russia peace treaty,” Abe said at the opening of parliament on January 22. But some are skeptical about the prospects of a comprehensive agreement on joint economic activities on the islands. It is hard to see Russia accommodating Japan’s demand for an underlying legal framework that doesn’t implicitly acknowledge Moscow’s claim to the territory, according to Temple University Japan associate professor James Brown, who specializes in Tokyo-Moscow relations. “Clearly Russia wouldn’t recognize Japanese sovereignty but they would be giving Japan, it would seem, a foothold onto the islands, which could subsequently be used for perhaps pushing for something more favorable,” Brown said. But she said she saw potential for greater security and political cooperation between the two countries. In March 2017, Japan and Russia held the first 2+2 meeting of defense and foreign ministers since the dialogue was suspended over Moscow’s annexation of Crimea. A range of contacts are planned in 2018, including a meeting of the foreign ministers in Japan in the spring, paving the way for Abe’s planned visit to Russia in May.